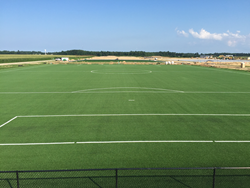 Installation of the first AstroTurf field at the new Kent County Regional Sports Complex is complete, and installation of the second field’s surface began this week. Construction is underway at the new Kent County Regional Sports Complex, and Delaware’s newest athletic institution will feature one of America’s most historic sports brands. Installation of the first field is complete, and installation of the second field’s surface began this week. The 85-acre facility, dubbed “DE Turf”, has selected AstroTurf® to provide the synthetic grass surfacing for this state-of-the-art park. The new DE Turf venue will ultimately feature 12 playing fields surrounding a centralized field house. The complex is expected to be a boon to youth sports participation while delivering a positive economic impact to the region. Once it opens, the complex will host both league and tournament play for youth sports including soccer, lacrosse, field hockey and more. DE Turf will attract both local and regional activity with world-class amenities and a convenient location, which is less than three hours from the major metropolitan areas of New York City, Philadelphia, Washington D.C. and Baltimore. Installation of the AstroTurf playing surfaces began last month. The DE Turf fields will feature AstroTurf’s Q44 product, a blended synthetic grass featuring both a slit film fiber and a monofilament fiber. The slit film fiber provides superior resistance to wear and tear, while the High Micron monofilament fiber provides grass-like aesthetics. The High Micron fiber measures 365 microns thick, making it especially durable. Sports Construction Management, a certified AstroTurf distributor, will handle installation of all of the AstroTurf playing surfaces at DE Turf. Spectacular multi-sport complexes, although a new and emerging trend, are by no means unfamiliar to the team at AstroTurf. Within their portfolio you’ll find clients such as Starfire Sports, training home for MLS’ Seattle Sounders FC. You’ll also find Spooky Nook Sports, whose massive 800,000 square foot indoor complex is surrounded by 8 multipurpose AstroTurf fields, and Rocky Top Sports World in Gatlinburg, Tennessee, a $20 million sports tourism destination with seven state-of-the-art synthetic turf fields from AstroTurf. For athletes and sport enthusiasts, AstroTurf® has redefined the way the game is played. The brand offers advanced, state-of-the-art, multi-sport and specialized synthetic turf systems with proprietary engineered technologies. A growing number of high schools, colleges, professional sports teams and municipalities continue to select AstroTurf-branded products for their premium quality, technical superiority, and safety. To learn more, visit AstroTurf’s recently redesigned website at http://www.astroturf.com.